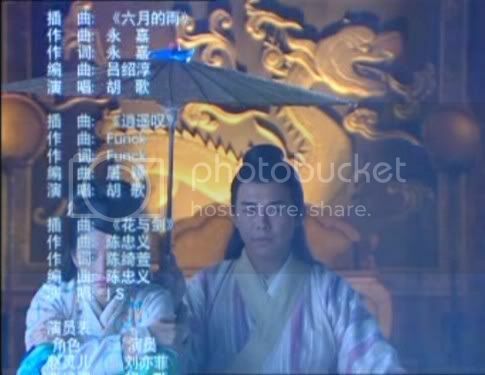 One Cut Scene: Xiao Yao and Ling Er holding hands and running happily, appears to happen sometime after they release Lao lao's ashes. I remember one at the graveyard with the zombies that the red devil demon thing. At one graveyard many zombies came up. They didn't show they cut off the head off the zombies on Singapore while on the CD it showed they cut off. Hmmm, that can't be in the game. Or be anywhere in the series either. Yue ru is wearing completely different clothing.. it's blue! It couldnt have been a flashbacl since her hair is different etc from when we first see her. No, it can only be a flashback that's never showned in the drama. I wana see that cut scene.. sigh..
Lightbrand wrote: No, it can only be a flashback that's never showned in the drama.